Way back in 1960 petrol cost 23 pence per gallon, John F Kennedy had just been inaugurated as President of the USA, Coronation Street was shown for the first time on TV, the farthing was still legal tender and Alfreton Town lost 1-7 to Belper Town in their first ever FA Cup tie - and until this weekend that record had stood as the worst Reds' home defeat. Cue the arrival of Spennymoor Town on Saturday and a repeat of that score-line has given Alfreton the unwanted record of their worst League defeat ever at home. Billy Heath made two changes with Danny O'Brien and Michael Collins coming in for their debuts. The game started in a tight fashion with a early free kick for Spennymoor when it looked like Martin Riley was the player pushed over, Henry headed the resulting free kick from Brogan over the bar in the first opening of the contest. But with six minutes gone, we gave away yet another penalty with handball being given against Riley from a cross on the left. Leading league scorer Glen Taylor stepped up and converted the penalty to give the visitors the lead. O'Brien showed good trickery on the right but his cross was claimed at the near post by Gould. Taylor threatened again but his header from Brogan's cross but Sam Ramsbottom held. 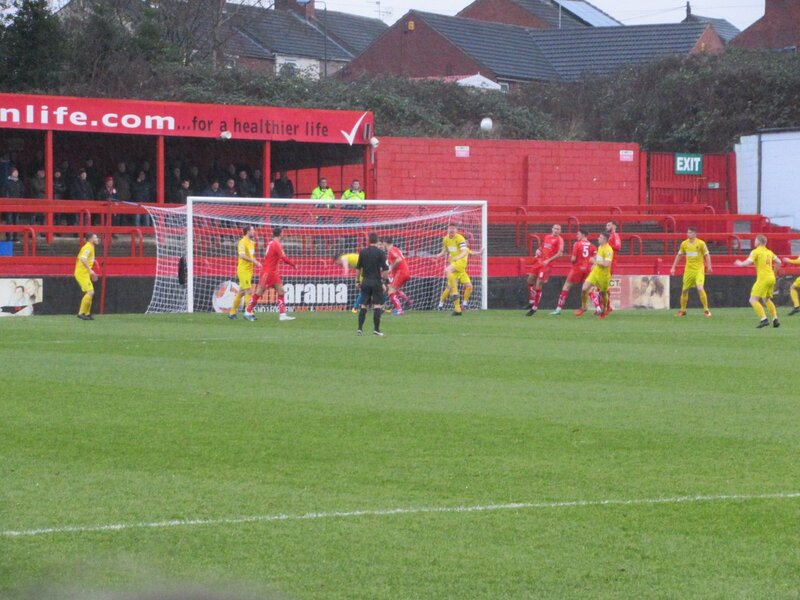 Gould saved from Reece Styche's free kick and was alert to prevent Richard Peniket sneaking onto the rebound. After 29 minutes Spennymoor were lucky not to be sent down to ten men as a late challenge on Tom Allan after the ball had gone by Chandler, looked to have been with two feet off the ground, Chandler was booked and a few minutes later the visitors doubled their lead. Taylor went down easily after an arial challenge and Brogan stepped up and bent a lovely free kick into the far corner. Two minutes later it was three, Taylor's shot was blocked by Riley high into the air and the ball looped towards the far post where Chandler showed great pace to beat Ramsbottom to it and convert. Just before the break we pulled one back as Styche converted a corner from Clifton at the far post with a neat header to at least give us some hope in the game. With the rain pouring down and rendering the pitch surface to a lot of standing water, the Reds nightmare continued as Spenny grabbed a fourth goal before the break in first half stoppage time. Taylor grabbed his second of the game slotting in from close range just two minutes after we looked to have got back into it. It capped off a truly horrible first half, although there were at least three key decisions that went against us in terms of the penalty awarded, the Chandler challenge and the free kick which led to the second goal, there were no excuses for our defending and a reaction was needed after the break. The second half proved worse for us with the ball holding up on the surface due to the standing water, we started the second period okay with James Clifton firing wide from range and then Peniket rattled the post from outside the box. Spennymoor made it 5-1 on 55 minutes with Taylor grabbing his hat-trick at the Impact Arena in consecutive seasons with an unchallenged header from a corner, it was far too easy for the Moors going forward with the Reds struggling on nearly every offence. 62 minutes it became 6-1, Riley's back pass to Ramsbottom held up on the surface and didnt reach the Reds goalkeeper, Tuton raced onto it and took it past Ramsbottom and slotted into the empty net. Spennymoor were running riot, Taylor curled wide of the post with Reds resistance coming from Styche who hit the bar from distance and David Lynch who forced a save from Gould who palmed his effort away from inside the D.
However Alfreton's embrassment got worse on 84 minutes as Johnson tapped in from a yard out after a header hit the post from a far post corner. Luckily that proved the last of the action as the Reds were on the end of a hammering at the Impact Arena, our worst ever home league defeat. Despite some decisions which could have gone differently, the Reds were out-classed and suffered a damaging defeat in which Billy Heath will need to lift the players again and look to respond with the visit of Buxton in the Derbyshire Senior Cup quarter final tomorrow night, with a 7.45pm kick off. Your support for this fixture will be especially important given the result on Saturday with both the performance and the need to win the game, top of the list tomorrow night. ATFCXI: Ramsbottom, Clackstone, Allan, Lynch, Riley (c) (Shiels 70), Curry, Clifton, Styche (Hotte 83), Peniket, O'Brien (Chettle 45), Collins. Subs Not Used: Hobson, Nicholson.